Mixed with noodles, fried with rice or even drizzled over meat, green onion oil is one of the most versatile things you can keep in your fridge. It tends to loose it’s vibrant green colour after a few days, but if anything, the taste gets better with age. Everyone has their own way of making green onion oil and the great thing about it is that you can tweak it so it’s just right for you. I like adding in shallots for sweetness and I always finish it with a dash of sesame oil. 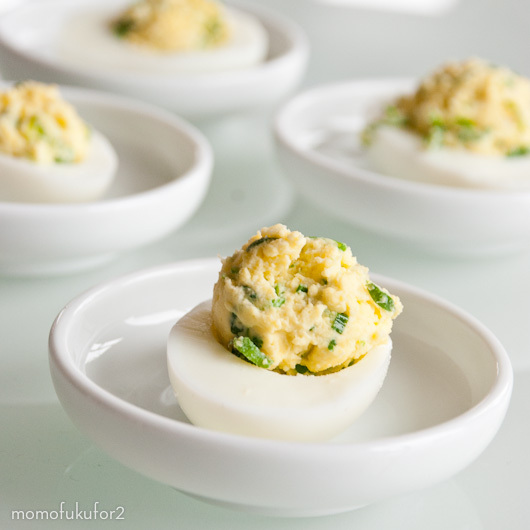 I’ve used green onion oil in a lot of dishes, but until the other day I never considered using them in devilled eggs. 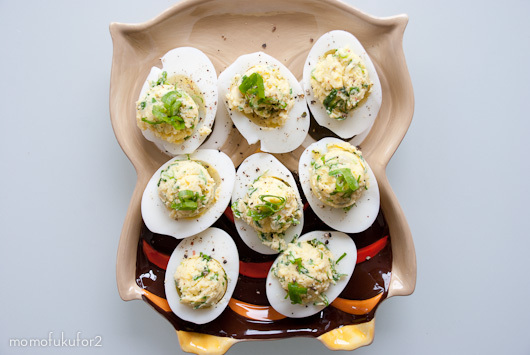 I’m not quite sure why I had a craving for devilled eggs filled with green onions, but I’m sure glad I did because these were some of the best devilled eggs I’ve ever had. Most people make devilled eggs for parties, but I like to make them for a snack for me and Mike. 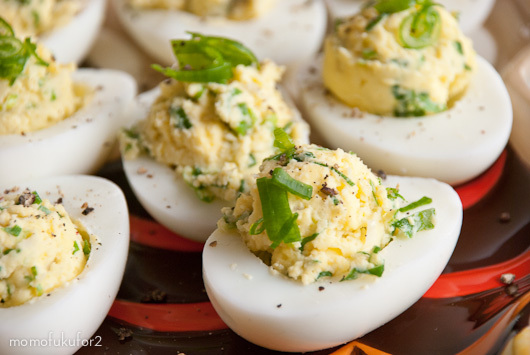 Green onion oil devilled eggs are a party regardless of how many people eat them. 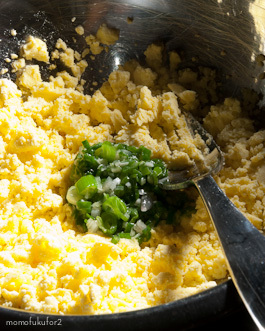 Rich egg yolks, fragrant, aromatic green onions and a hint of sesame oil make me want to eat devilled eggs forever. Add a squirt of sriracha and you’re in heaven! 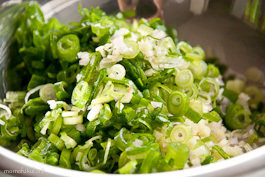 *this recipe will make much more green onion oil than you’ll need for the eggs, but I’m sure you won’t find it hard to come up with ways to eat it. Remove the yolks from the eggs and place in a bowl. Mash with a fork until the yolks are crumbly. 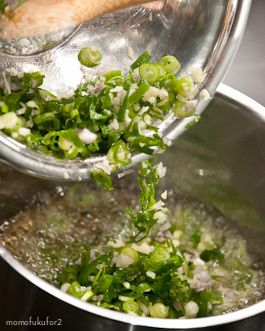 Add 1-2 tablespoons of the green onion oil. Stir and taste. If you need more green onion oil in there, by all means, add it! Fill your egg halves and top with freshly ground pepper and a squirt of sriracha, if using. Enjoy! Feel free to link the photos and thanks! I love Owls =). I’ll have to give this recipe a try and I don’t even eat devilled eggs. Owls make everything taste better! I just made these for lunch and they are delicious! I bet it’s even better if I had an owl plate to eat it off too hhehehe. Keep on blogging I love your page! I always put on sesame oil on my boiled eggs. Wonderful combination. I like that little grey owl. FINALLY read my way through the archives and I absolutely LOVE LOVE LOVE your site. Please don’t ever stop writing! Your pictures are gorgeous! Fantastic website! I made some of these eggs tonight and they were AMAZING! Thank you!! ooh that looks really really good! 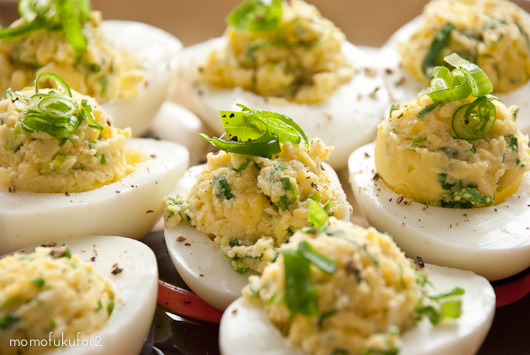 very creative way of making deviled eggs. YUM! 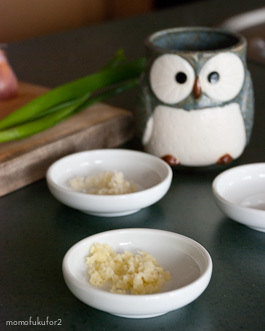 I am already thinking of all the things I want to use that Green Onion oil on! These eggs look delicious! I just made this and they are wonderful. Make extra! I am eager to make some green onion oil! Can you recommend some storage guidelines? I am guessing that it should be refrigerated. But how long does it keep? …Assuming I don’t use it all up in no time at all! Ahh.. green onion oil/paste. Great stuff. We’d have it on white cut chicken and rice anytime we could get our chopsticks on it. 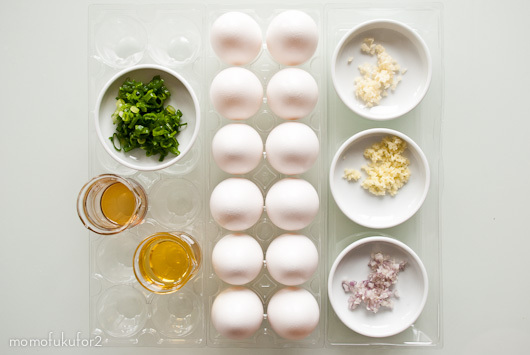 although the eggs look great and i now think i need green onion oil on hand… where is that oil serving dish from?! too cute! I typically flavor the green onions oil with some fish sauce and drizzle them on fried tofu. Green onion oil is a must in life! My grandma made green onion oil by mincing green onion with a bit of fresh ginger root then mixing it with salt and peanut oil into a paste. SO yummy. We always had it with steamed chicken and rice. Your green onion oil is amazing! !so flavourful. 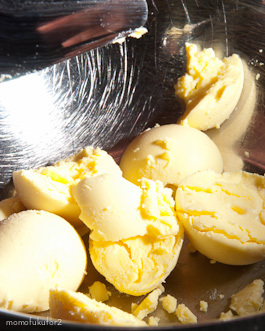 How do you get the scooped filling so perfectly shaped? Would it disturb the taste of the Green Onion Oil if you were to use olive oil rather than Canola oil. I do not at all like the taste of canola oil. It’s a bout time I tell you how much I love this recipe. I made it for christmas two years ago and since then I have been experimenting with it in combination with different toppings added. My favorite right now is to have a bit less of the egg/green onion mixture and top it with a safron youghurt, salmon roe and some small shrimp. The result is amazing and I’m so thankful for your recipe for both the green onion oil and the deviled eggs!